I’m off to Costco to buy a gallon of dishwashing soap (that’s the only way they sell it!). While I’m fighting my way through the bargain hunters, please enjoy this selection of Caturday felids, with lagniappe. I’m not big on fat-shaming cats, but who won’t laugh when they see Cats of Size struggling to get through their catflaps? Theo’s staff has promised to go and give us a report. 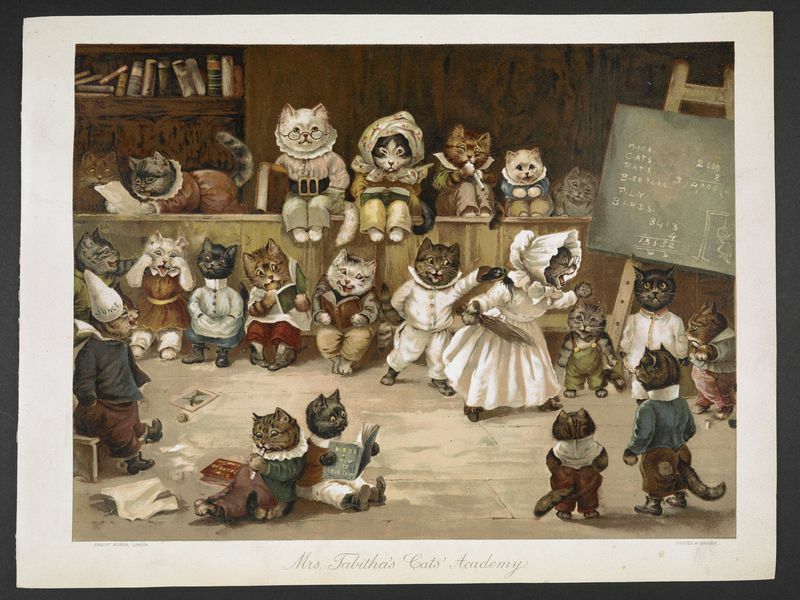 Titled Cats on the Page, the new show features relics that span from the 16th century to the modern era. Perhaps unsurprisingly, many of the works on display originate from children’s literature. There are, for instance, illustrations of Cat in the Hat, Mog (the feline protagonist of a beloved series by Judith Kerr) and a rendering of Beatrix Potter’s Kitty-in-Boots by Quentin Blake, the British artist best known for illustrating the books of Roald Dahl. The works of T.S. Eliot also feature prominently in the exhibition—the show is, in fact, timed to overlap with the 80th anniversary of his whimsical poetry collection Old Possum’s Book of Practical Cats, according to Ailis Brennan of the Evening Standard.
. . . Not all of the items on view, however, are quite so fuzzy in nature. Visitors can see a late 16th century pamphlet describing the alleged misdeeds of four women accused of witchcraft. A woodcut illustration in the pamphlet depicts a black cat purported to be one of the witches’ “familiars”—wicked spirits that took the form of animals and fed on the witches’ blood. Here’s one item displayed on the Smithsonian site. Look at the bad kitty getting its ear pulled! 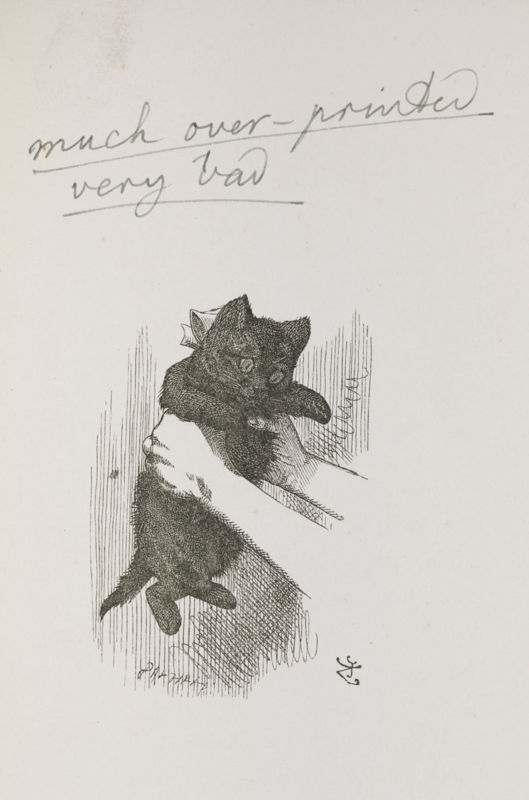 It is an apparently sweet illustration of Alice holding her black kitten Kitty before going though the mirror but it absolutely infuriated the writer Lewis Carroll. “Much over-printed … very bad,” is his testy, underlined scribble. Carroll’s Trump-like anger at the printing of his book Through the Looking-Glass and what Alice Found There is revealed in a new exhibition opening at the British Library which explores and celebrates cats in literature. Carroll took delivery of the book on 21 November 1893 and was enraged at what he saw as poor-quality printing. He went though it marking up the pages which angered him most, including the illustration with Dinah’s black kitten. He also wrote in the copy and later his diary “the pictures [were] so badly printed that the books are not worth anything”. Carroll was so incensed that he instructed his publisher, Macmillan, to destroy all 940 copies of the print run still held. Public announcements were hurriedly placed in the Times and the Daily News requesting the return of 60 copies which had already been sent out and the writer demanded “no more Wonderlands are to be printed … till I give permission”. Fortunately, the copies were not destroyed. By December Carroll had calmed down and decided they should be “presented for the use of Mechanics’ Institutes, Reading Rooms, etc”. Only three are known to have survived. Finally, a year ago—on November 26, 2017—the cheetah Bingwa (Acinonyx jubatus) at the Saint Louis Zoo gave birth to EIGHT cubs (the dad was named Jason). Now that they’re one, and have just begun, the Zoo has put out a video showing their birth and growth. Eight cubs is a HUGE litter! (The average number is three to five.) Since females can give birth every 17 to 20 months, this shows that the mortality of young cheetahs must be enormous. But these ones are safe, though in captivity. I get the sense that these fast-running cats really want more space. If reading WEIT on a daily basis has done anything for me, it’s raised my awareness of cats in art. 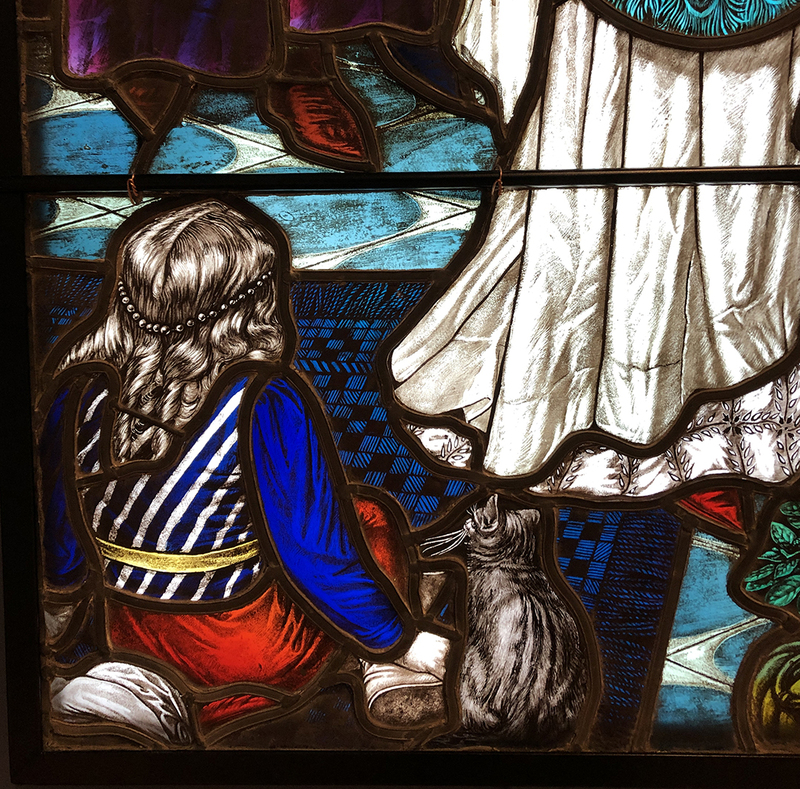 I definitely noticed this cat in the Oklahoma City Museum of Art last week, but I only had my iPhone with me instead of a real camera. 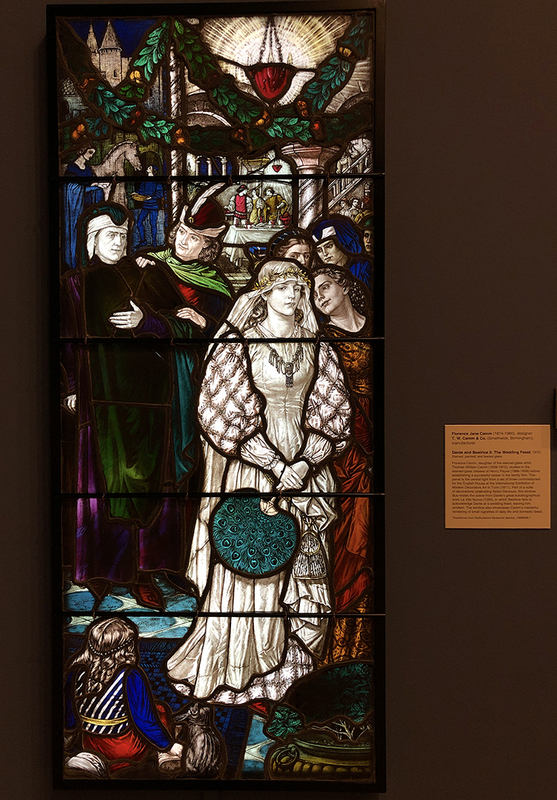 The placard states the title of the piece is “Dante and Beatrice II: The Wedding Feast”. The work was designed by Florence Jane Camm (1874-1960) for T. W. Camm & Co. (Smethwick, Birmingham) in 1910. It was part of a three-piece set commissioned for the English House at the International Exhibition of Modern Decorative Art in Turin. The piece includes stained, painted, and leaded glass. See the tabby? Here it is! This entry was written by whyevolutionistrue and posted on December 1, 2018 at 9:00 am and filed under Caturday felids. Bookmark the permalink. Follow any comments here with the RSS feed for this post. Both comments and trackbacks are currently closed. Yes, feel sorry for the poor animals. It is toward the owners we owe some disdain. Also, in the upper right – note what appears to be an extreme closeup of a cat’s muzzle with a tongue slip. Sorry for my ignorance or lack of insight this morning, but what does “Much over-printed” mean? Is he referring to the print of the artwork being poor quality? Too dark? That the picture is too large and detracts from the written word on the page? That the artist is focusing on the cat as a subject too much? ** This wood block can be used for printing, but it wears out fairly quickly & then you’re stuck if a reprint is required – a redraw & a recarve required! Obviously the carving of the wood block & the electroplating process will both act to produce marginally thicker lines than in the original Tenniel pencil-on-wood drawing. When you look at an original PENCIL Tenniel it is a different affair to what appears in the bound book: the darkness/lightness of pencil line can’t be reproduced in carving, variation in line thickness is mostly gone, lines on average are thicker than the original pencil. I assume Carroll sees this loss of subtlety & thinks too much ink has been put on the copper plate before printing, when in fact the problem is in the process itself & isn’t fixable by putting less ink on the plate. I expect the artist/engravers eventually persuaded Carroll of this reality & hence the books were eventually released for mere mechanics to read! Carroll was a right old fusspot when it came to the process of making books – he got through six or so illustrators in his life. Imagine setting a fixed price with the guy & then you find the one drawing needs to be done six times for not much more coin. I should add that I have no certain knowledge of the above – I’m guessing about Carroll’s thoughts. Nice analysis. Who knew there was so much to simple kitty pic? JT drew those as very thin continuous lines [thus they appear grey rather than very dark grey in the pencil original I imagine] & the engravers emulated this by carving the line spaces & then cross-carving to produce dots. Not possible to do where there’s a great density of lines though. So when we look at Dinah’s right paw [as we view] it disappears into the dark shadow of the hand. If JT & the Bros had known from day one Carroll intended copper plate printing I’m sure JT & the Bros would have lined & cross hatched differently to maintain contrasts in the finished, printed kitty. Sounds plausible. I have experimented with engraving just a bit. What you describe fits with what I experienced in terms of getting the effect you want. The kitty pick certainly looks muddy compared to some of the best engraving. Check out paper money too. Yes, mortality among young cheetahs must be very high. Many of those catflaps are too high, much higher than walking height, and would even be difficult for a normal size cat. True, but on the other paw one of the flaps through a wooden door cuts right through the frame joint at the bottom of the door, which would destroy the structural integrity of the door. And potentially invalidate any insurance policy for the householders. It took me a few seconds to work out what looked ‘wrong’ there, but I spent much of yesterday down at the woodworking shop and my head is obviously full of tenons and dovetails today.